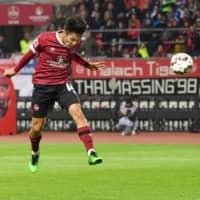 NUREMBERG, GERMANY - Striker Yuya Kubo on Friday scored his first goal since joining German first-division side Nuremberg in a 1-1 draw with Schalke. Kubo headed home a long-range pass from Matheus Pereira to open the scoring in the 82nd minute, but the visitors equalized three minutes later. Kubo, 25, has struggled to earn playing time since being loaned by Belgian first-division side Gent ahead of the season. Nuremberg, promoted to the Bundesliga top tier after finishing runner-up in the second division last season, sits 17th in the 18-team table.